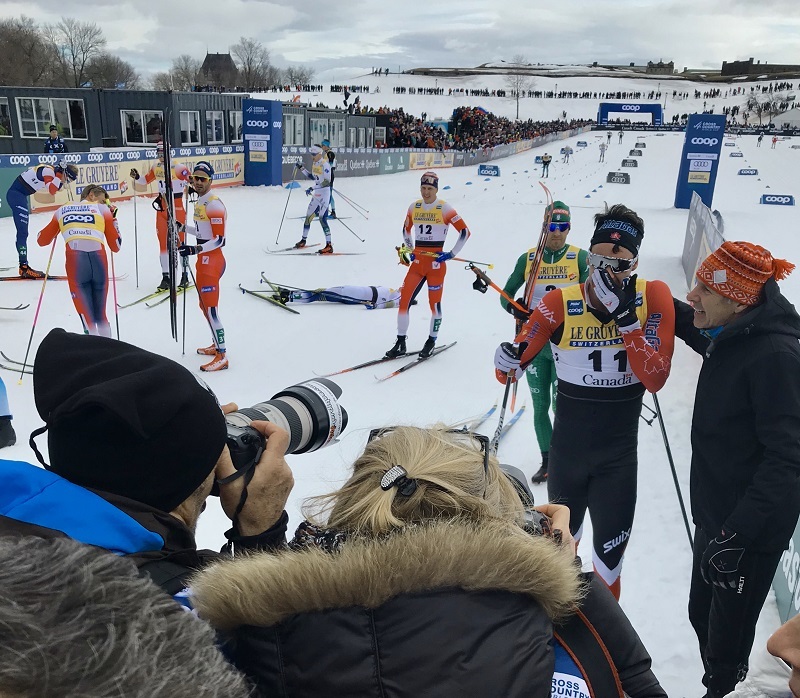 On March 23, world champion cross-country skier Alex Harvey won a silver medal in the second-to-last race of his career in Quebec City. Thousands of spectators were there, most of them to encourage their renowned Canadian athlete. Harvey finished the 15-kilometre race in just over 36 minutes. Photo by Anne-Sophie Jobin. Harvey started skiing when he was three years old. He is a five-time International Skiing Federation World Championships medalist and made more than 31 World Cup podium appearances. For most Canadians, Harvey represents a source of pride in the world of cross-country skiing. It’s only fitting he got to end his career at home. A fan holds a face poster of Harvey. Photo by Anne-Sophie Jobin. Throughout the crowd, signs and banners supporting Harvey could be seen. The buzz of the crowd and the sound of bells designated for Harvey created an emotional and patriotic atmosphere. Harvey’s retirement is really something that touched Canadians, and this event was the peak of his success. For most Canadians, Alex represents pride in the world of cross-country skiing. His career ended on a high note, with two podiums over the weekend, a gathering of people to celebrate his success, and a championship in his home province. While Harvey has made his mark on cross-country skiing, Canadians are ready to welcome a new athlete to honour his legacy. Main photo by Anne-Sophie Jobin.